When people talk of the great pyramids of the world the conversation generally goes straight to the Egyptian pyramids. However, having been to the Great Pyramids of Giza, as well as pyramids on two other continents, I have never been blown away by the pyramids of Giza. I remember the first time I walked into the jungle of Tikal National Park and saw the tall limestone pyramids stretching through the trees and into the sky. I wasn’t just impressed, I was blown away. How could a city of 150,000 people have once existed on the very grounds that I am standing on? What would it have looked like fully populate? I have never been anywhere in my life where my imagination ran wild like the first time I visited Tikal. Today, the ruins have been partly taken over by the jungle. Monkeys swing from trees, coatis climb the pyramids and hummingbirds dance on the flora. 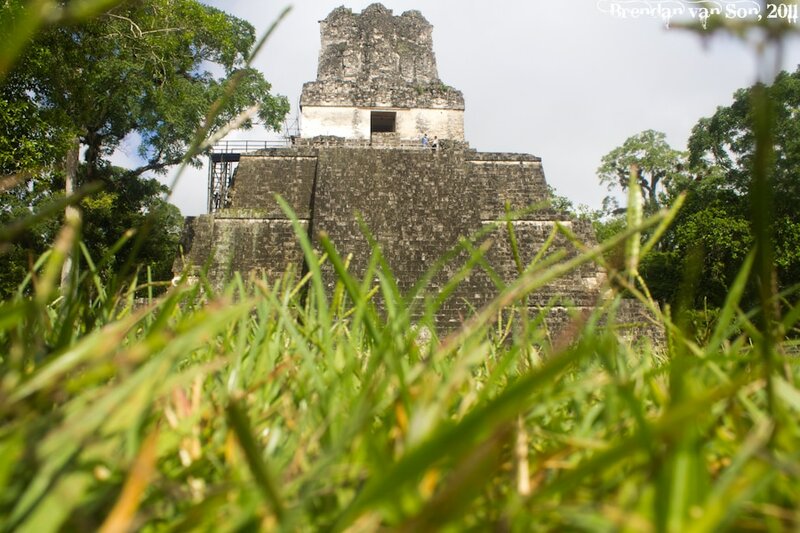 This image is a preview from my upcoming Tikal photo essay. Stay tuned. The pyramids at Tikal have been shot millions of times so when I set out to photograph it I had a specific goal: to get different photos. To get different looking photos you need to climb higher than other people, or get lower than others. There was nothing all too technical about getting this shot. In fact, technically I struggled a little bit due to poor light. The only thing I did special in this shot was to forget my pride and lay down in the grass to take a worm’s eye view of the pyramid. It’s like I always say, if you photograph the world from eye-level your photos will only show the world through the usual perspective. Choose different angles and through your photos you will show the world in a whole different way. Nice shot too bad about the scaffolding! We just visited Tikal a few weeks ago and loved it. We took so, so many photos! I would love to invite you to check out my Guatemala photography. Were there millions of bees in the grass like when I was there a few weeks ago? So many bees an they were so loud! I just wrote an article a couple of weeks ago (still featured on my main homepage slider) about changing your vantage point to create better photos. I couldn’t agree with you more – getting down on the ground or climbing up a tree, twisting or contorting in other ways & being prepared to see the world from the perspective or vantage point of others truly makes for some spectacular photos.